Rick Porcello worked around a pair of home runs by Edwin Encarnacion en route to a strong start that led the Red Sox to a 5-3 victory over the Blue Jays in the opener of a four-game series on Friday night at Fenway Park. The two dingers by Encarnacion (a solo shot in the second and a two-run shot in the seventh) were the only hits the righty allowed over his 6 1/3 innings. Porcello exited after striking out Troy Tulowitzki on his 100th pitch. The righty gave up three earned runs while walking one and striking out eight. Porcello looked comfortable with new batterymate Christian Vazquez, who was activated before the game in his return from Tommy John surgery. 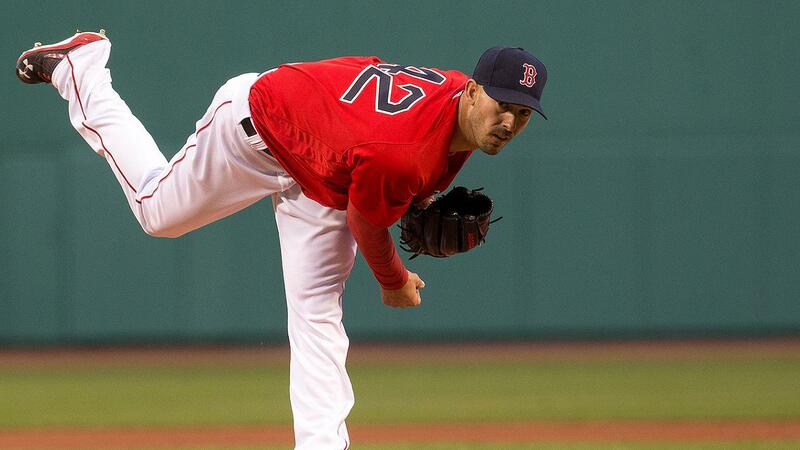 "It was a good win for us, a good way to open up a series," Porcello said. "I can't say enough about the job Christian did back there. Blocking balls, calling the game, he was tremendous." The Red Sox jumped out to a 3-0 lead against knuckleballer R.A. Dickey in the bottom of the first. David Ortiz smashed an RBI double to center. Travis Shaw added a two-run double. "I'm not disappointed in my knuckleball -- I'm disappointed in the results, obviously," Dickey said. "But my knuckleball has been pretty good. It's moving late, I'm keeping the ball in the ballpark a majority of the hits this year. They covered a few off the wall today, but it just seems like everyone that doesn't do something gets hit, and that's not always going to happen. It's going to even out here soon. So I've just got to keep pushing forward." Encarnacion's second homer slimmed Toronto's deficit to 5-3. The Red Sox have taken three out of four from the Blue Jays this season. "Good game, man," Ortiz said. "Porcello, last game he pitched, they scored some runs early, and then he kind of put it together. That was a good sign. Today, it was like the continuation of what he did the last game. He looked real good." Vazquez makes quick impact: It didn't take long for Vazquez to make an impact in his first game back from the disabled list. The cannon-armed catcher ended the top of the second by firing to first base to pick off Troy Tulowitzki. Vazquez had a pop time of 1.5 seconds on the play. In the bottom of the second, Vazquez clubbed a one-out double off the Green Monster and scored on a single by Mookie Betts. In the sixth, Vazquez laced one off the Monster again, and was held to a single. Encarnacion powers up: Encarnacion entered the game with no home runs and four RBIs this season. He had two home runs with three RBIs against Porcello on Friday, the only hits and runs the Blue Jays could muster against the Red Sox's right-hander. Encarnacion had just one home run in 29 career at-bats against Porcello entering the game. Hustling Hanley: Hanley Ramirez continues to look like a rejuvenated player for the Red Sox. In the bottom of the first, Dickey struck him out for what should have been the third out of the inning. But as the ball scooted by catcher Josh Thole for a passed ball, Ramirez ran all-out to first base and just beat the throw. The Red Sox were rewarded for his hustle when Shaw smoked his two-run double. "In Hanley's case, it doesn't show up in the box score with a base hit, but that hustle out of the box with the strike three sets up the ability to score three runs in that first inning," Boston manager John Farrell said. "Things that we can control -- and that's the effort, that's the intensity, that has been very good through these first nine games." When Vazquez reached second on his double, he appeared to come off the bag for a moment on the slide. Blue Jays manager John Gibbons challenged the call, but the replays were inconclusive and the call stood after a deliberation of 2 minutes and 35 seconds. The Blue Jays entered the game with 100 strikeouts. They added 12 strikeouts to their total on Friday. "I've got no idea why," Gibbons said. "We're very aggressive. That's kind of our mentality, but we got a lot of guys, too, that have a real good idea of the strike zone. But that's not necessarily uncommon when you start pressing a little bit, trying to make something happen. But that'll change." Blue Jays: Right-hander Marco Estrada makes his second start of the season on Saturday -- and his second start against the Red Sox. In his first outing, Sunday at Rogers Centre, he went seven scoreless innings, giving up five hits and two walks with eight strikeouts. In three games -- two starts -- against Boston last season, he went 2-1 with a 6.10 ERA. In two appearances at Fenway Park, he was 2-0 with a 5.63 ERA. First pitch is 4:05 p.m. ET. Red Sox: Lefty David Price faces the Blue Jays -- the team he finished last season with -- in his third start for the Red Sox. As a member of the Blue Jays, Price went 9-1 with a 2.30 ERA in 11 starts.